The first German serviceman killed in the war was killed by the Japanese. More U.S. Servicemen died in the Air Corps then the Marine Corps. Polish Catholic midwife Stanisawa Leszczyñska delivered 3,000 babies at the Auschwitz Concentration camp during the Holocaust in occupied Poland. In World War II, British soldiers got a ration of three sheets of toilet paper a day. In 1941, more than three million cars were manufactured in the United States. Only 139 more were made during the entire war. Only 20 percent of the males born in the Soviet Union in 1923 survived the war. In World War II, the youngest serviceman in the United States military was Calvin Graham - age 12. Graham lied about his age when he enlisted in the US Navy. Only one out of every four men serving on U-boats survived. The Siege of Stalingrad resulted in more Russian deaths (military and civilian) Than the United States and Britain sustained (combined) in all of World War II. Adolf Hitler’s nephew, William Hitler, served in the US Navy during World War II!!! Adolph Hitler and Henry Ford each kept a framed picture of the other on his desk. During World War II, the largest Japanese spy ring was actually located in Mexico. 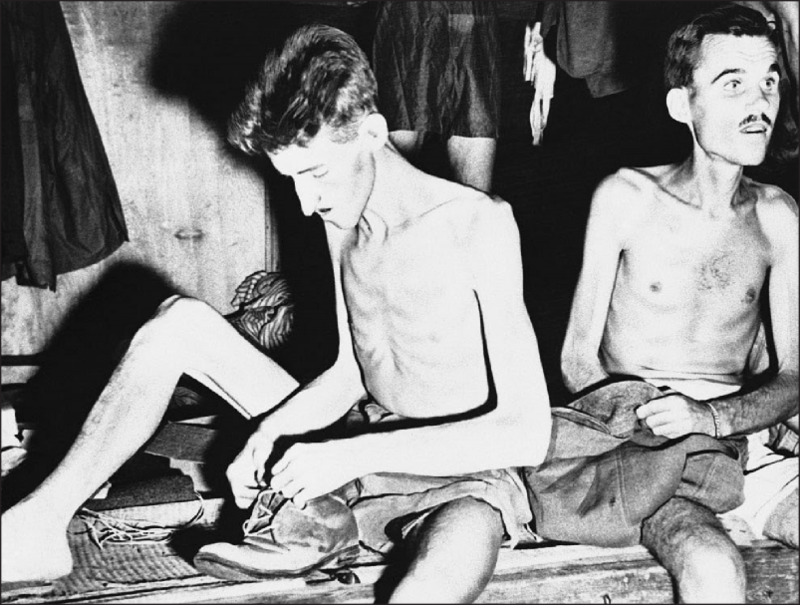 The mortality rate for POWs in Russian camps was 85 percent. An Imperial Japanese Army intelligence officer, who fought in World War II, Hiroo Onoda never surrendered in 1945. Until 1974, for almost 30 years, he held his position in the Philippines. His former commander traveled from Japan to personally issue orders relieving him from duty in 1974.
were civilians, with the majority of those being women and children. 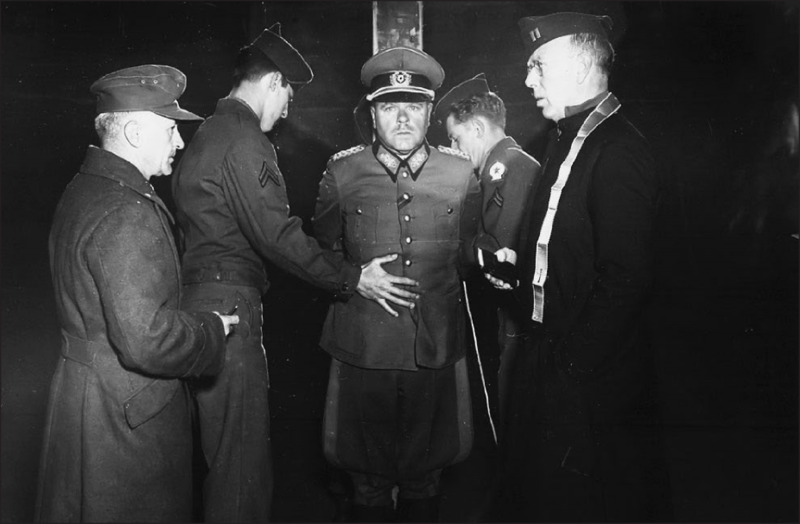 German Wehrmacht General Anton Dostler is tied to a stake before his execution by a firing squad in a stockade in Aversa, Italy, on December 1, 1945. The General, Commander of the 75th Army Corps, was sentenced to death by an United States Military Commission in Rome for having ordered the shooting of 15 unarmed American prisoners of war, in La Spezia, Italy, on March 26, 1944. 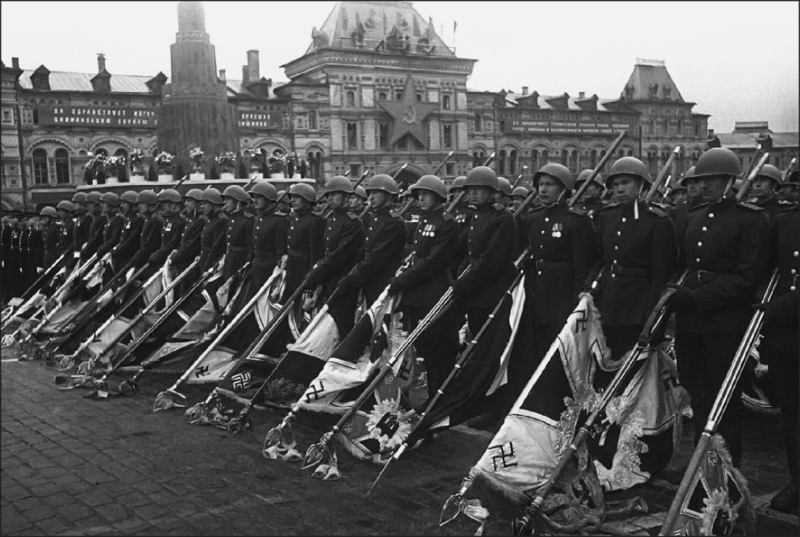 Soviet soldiers with lowered standards of the defeated Nazi forces during the Victory Day parade in Moscow, on June 24, 1945. Gaunt and emaciated, but happy at their release from Japanese captivity, two Allied prisoners pack their meager belongings, after being freed near Yokohama, Japan, on September 11, 1945, by men of an American mercy squadron of the U.S. Navy. 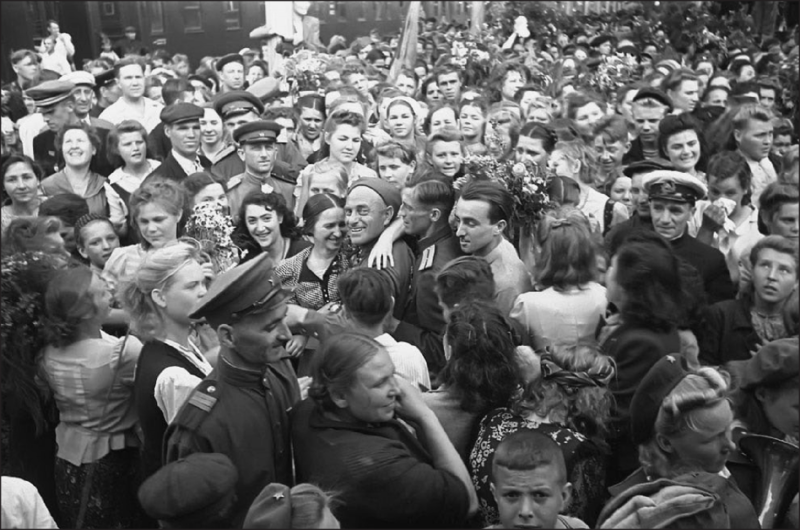 The return of victorious Soviet soldiers at a railway station in Moscow in 1945. 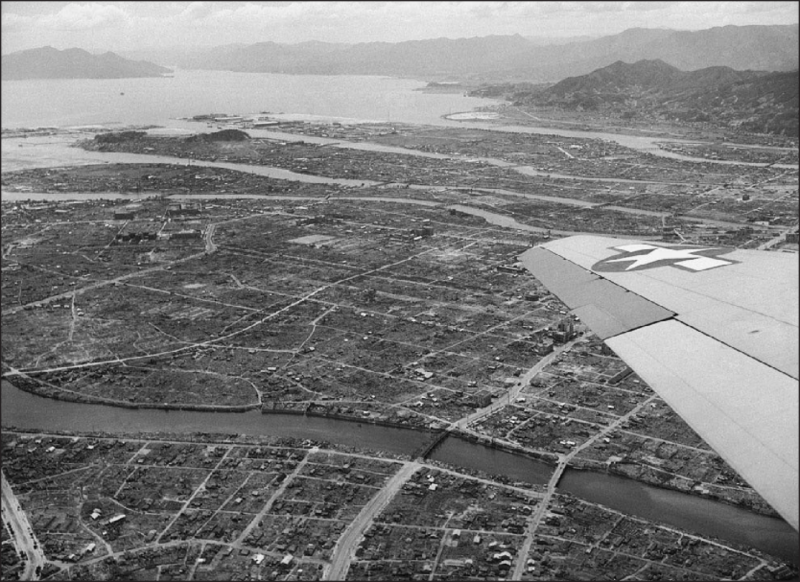 Aerial view of Hiroshima, Japan, one year after the atomic bomb blast shows some small amount of reconstruction amid much ruin on July 20, 1946. The slow pace of rebuilding is attributed to a shortage of building equipment and materials. 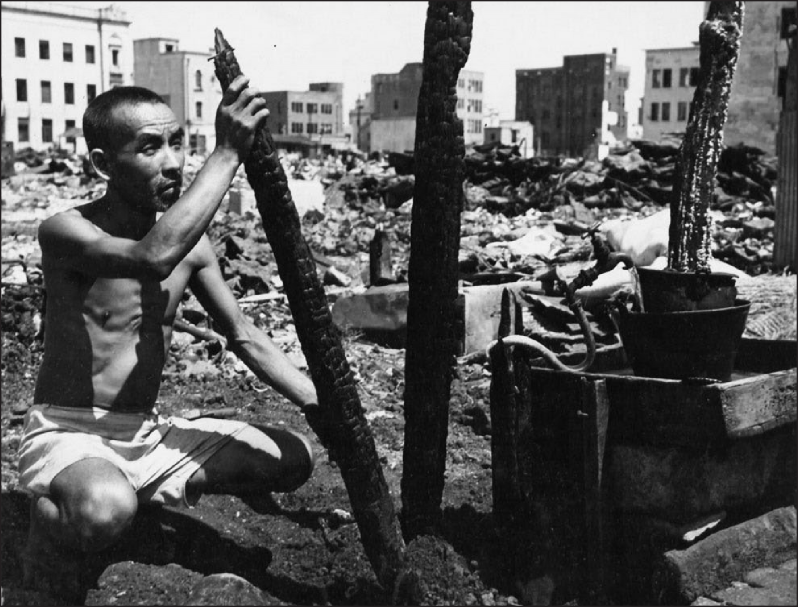 A Japanese man amid the scorched wreckage and rubble that was once his home in Yokohama, Japan. 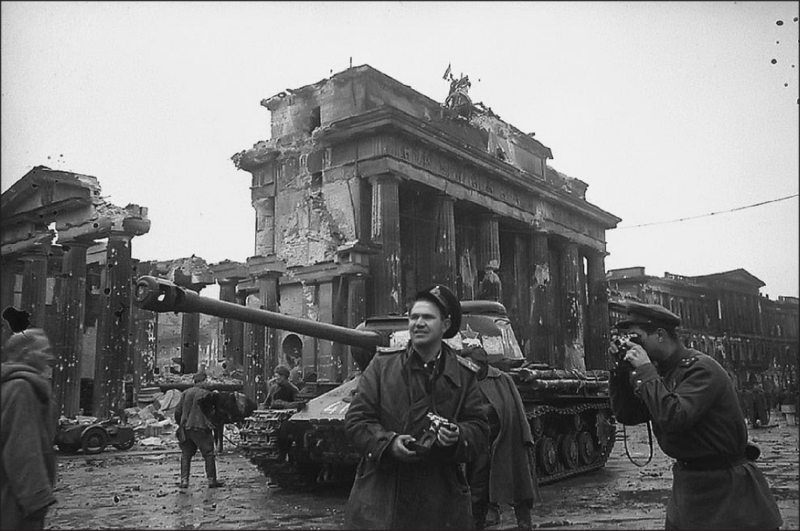 Red Army photographer Yevgeny Khaldei (center) in Berlin with Soviet forces, near the Brandenburg Gate in May of 1945.
bomb craters dot the grounds around the wreckage. 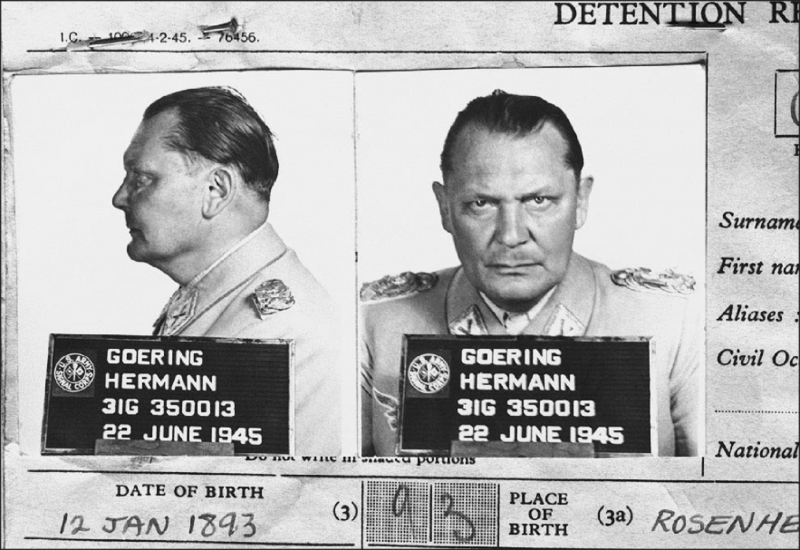 Hermann Goering, once the leader of the formidable Luftwaffe and second in command of the German Reich under Hitler, appears in a mugshot on file with the Central Registry of War Criminals and Security Suspects in Paris, France, on November 5, 1945. Goering surrendered to U.S. soldiers in Bavaria , on May 9, 1945, and was eventually taken to Nuremburg to face trial for War Crimes. (blurry face), and Ernst Kaltenbrunner, the highest ranking surviving SS-leader. 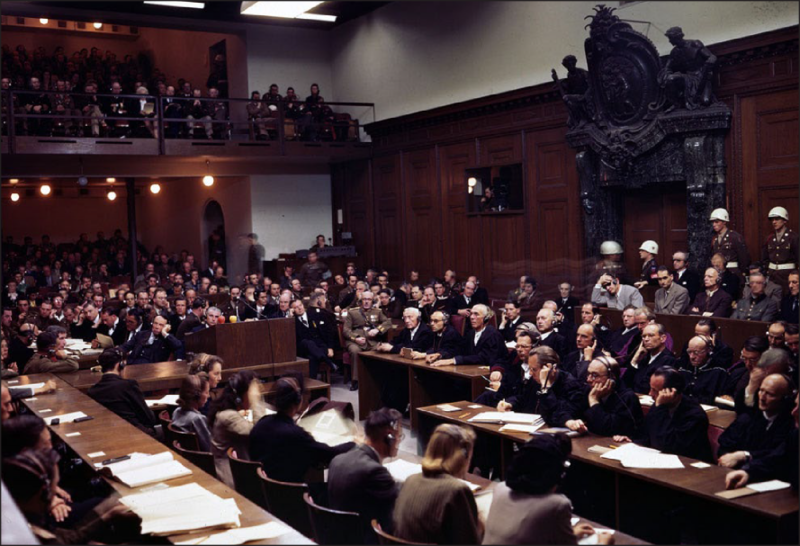 Goering, von Ribbentrop, Keitel, and Kaltenbrunner were sentenced to death by hanging along with 8 others -- Goering committed suicide the night before the execution. Hess was sentenced to life imprisonment, which he served at Spandau Prison, Berlin, where he died in 1987. Many of Germany ‘s captured new and experimental aircraft were displayed in an exhibition as part of London ‘s Thanksgiving week on September 14, 1945. Among the aircraft are a number of jet and rocket propelled planes. 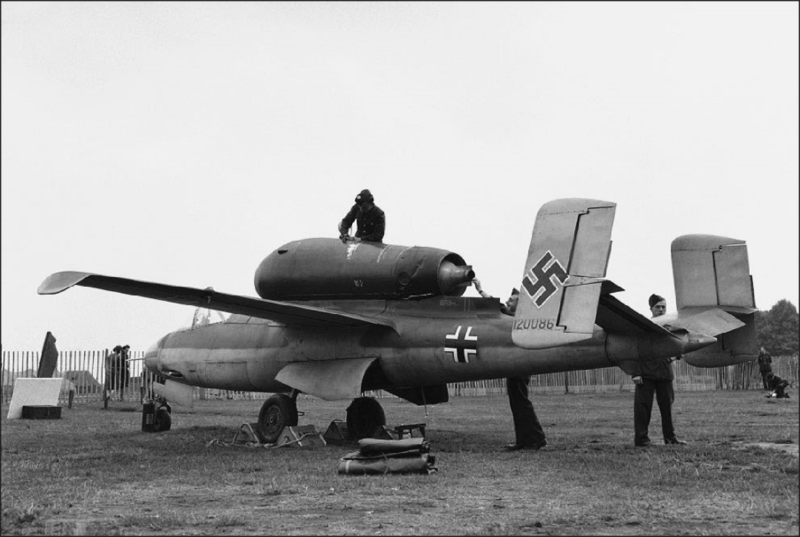 Here, a side view of the Heinkel He-162 “Volksjaeger”, propelled by a turbo-jet unit mounted above the fuselage, in Hyde park, in London. 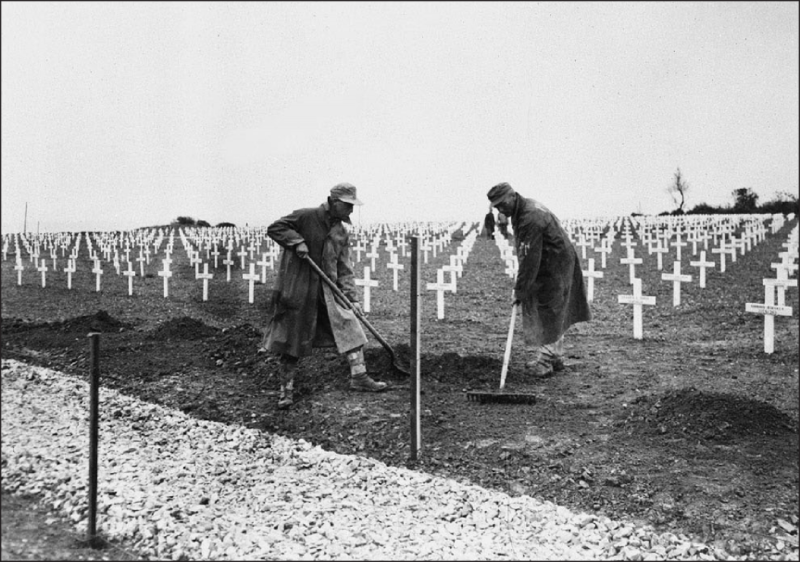 One year after the D-Day landings in Normandy , German prisoners landscape the first U.S. cemetery at Saint-Laurent-sur-Mer, France, near “ Omaha “ Beach, on May 28, 1945.
. 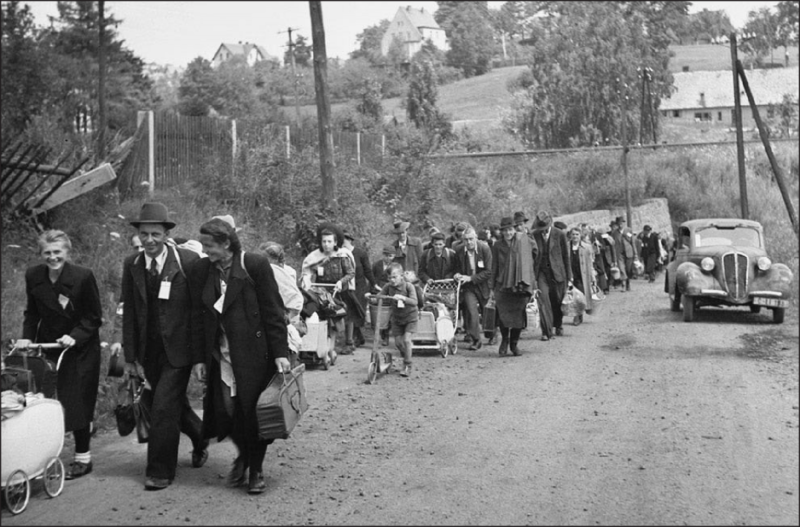 The estimated numbers of Germans involved ranges from 12 to 14 million, with a further estimate of between 500,000 and 2 million dying during the expulsion. 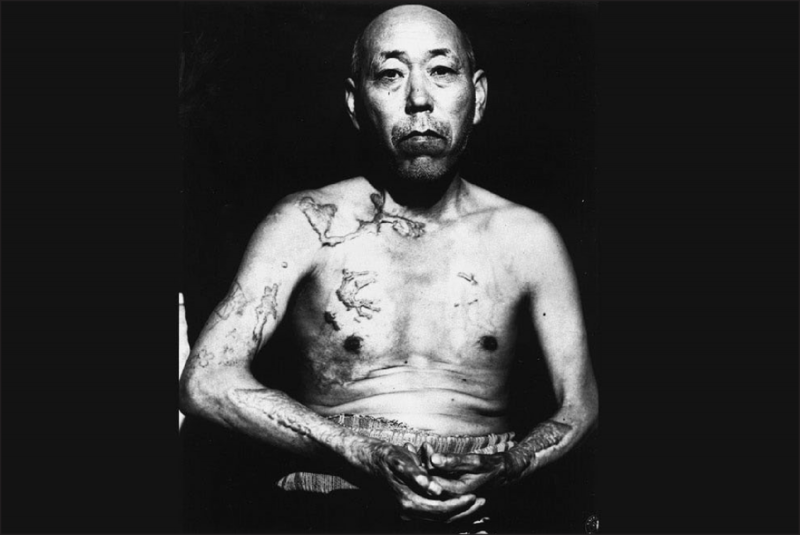 A survivor of the first atomic bomb ever used in warfare, Jinpe Teravama retains scars after the healing of burns from the bomb explosion, in Hiroshima, in June of 1947. 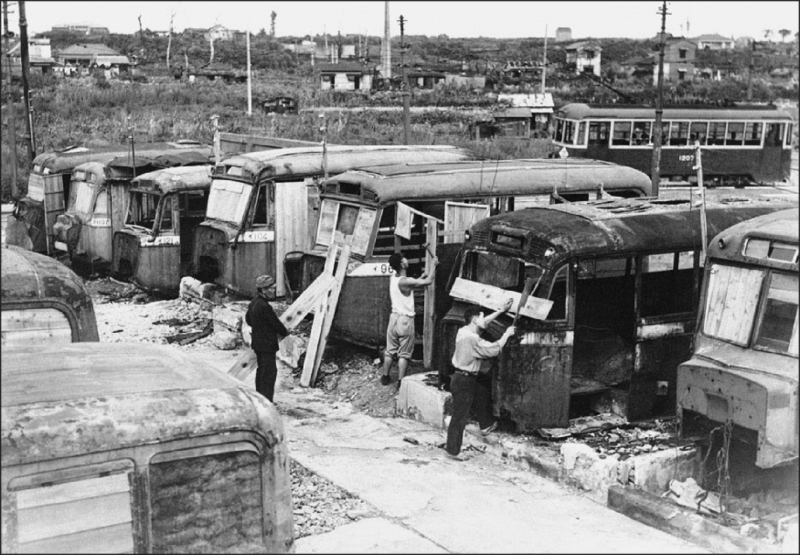 Disabled buses that have littered the streets of Tokyo are used to help relieve the acute housing shortage in the Japanese capital on October 2, 1946. Homeless Japanese who hauled the buses into a vacant lot are converting them into homes for their families. An American G.I. 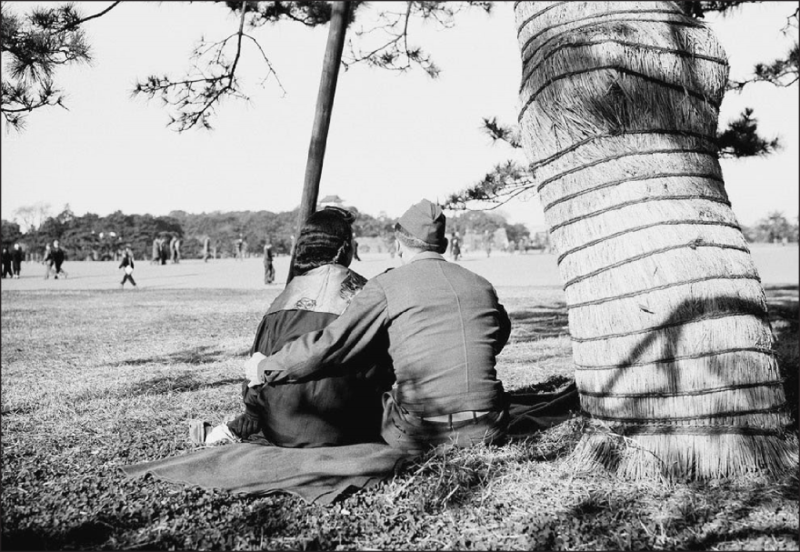 places his arm around a Japanese girl as they view the surroundings of HibiyaPark, near the Tokyo palace of the emperor, on January 21, 1946. 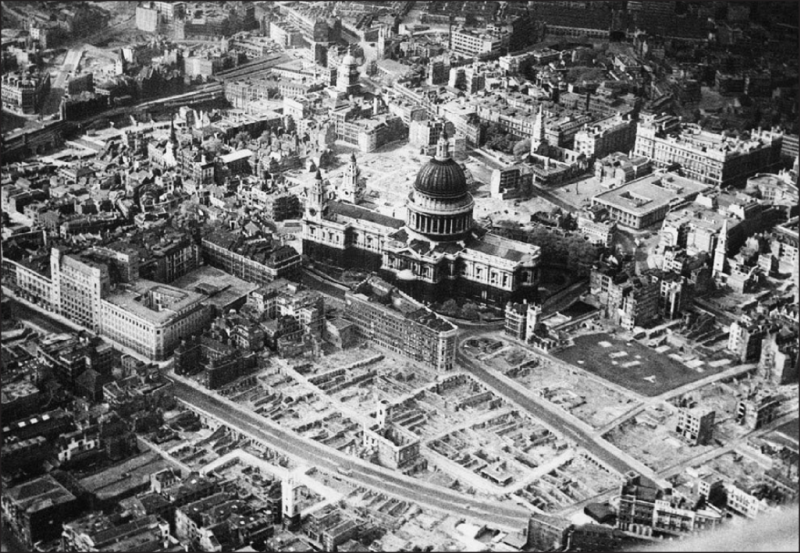 This is an aerial view of the city of London around St. Paul ‘s Cathedral showing bomb-damaged areas in April of 1945.
, in July of 1945. Lorient was the location of a German U-boat (submarine) base during World War II. 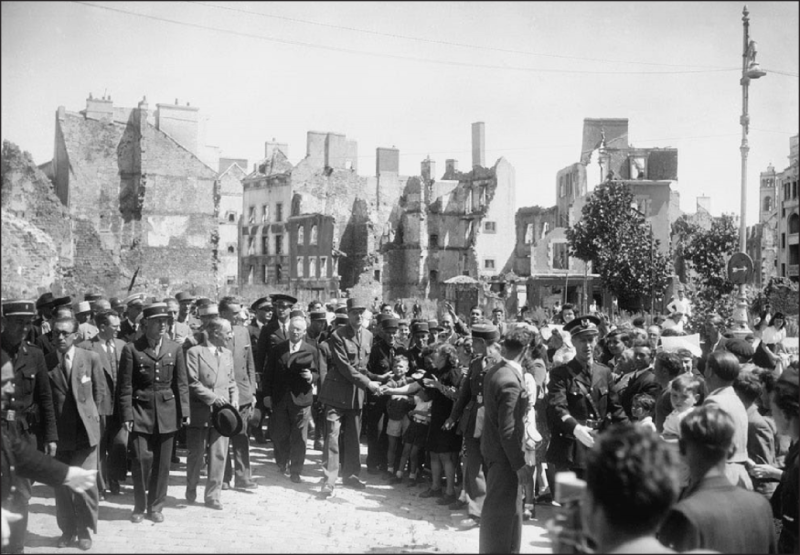 Between January 14 and February 17, 1943, as many as 500 high-explosive aerial bombs and more than 60,000 incendiary bombs were dropped on Lorient . 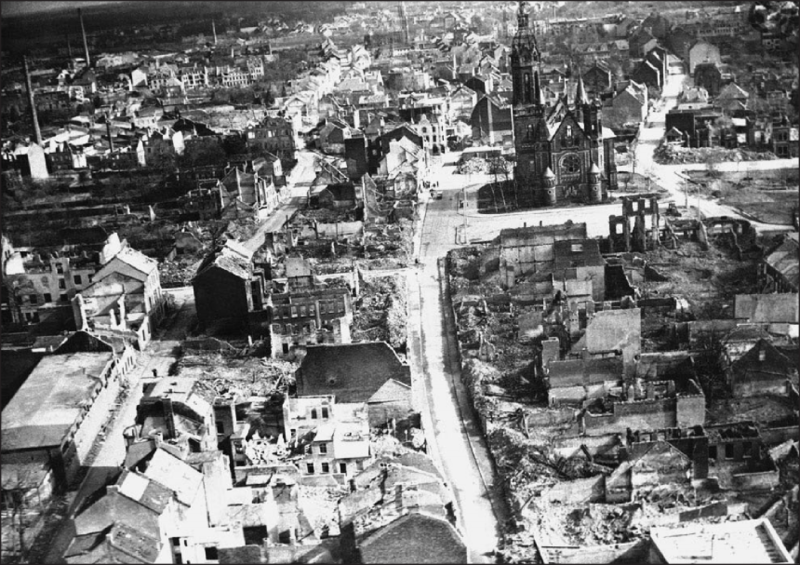 The city was almost completely destroyed, with nearly 90% of the city flattened. The super transport ship, General W.P. 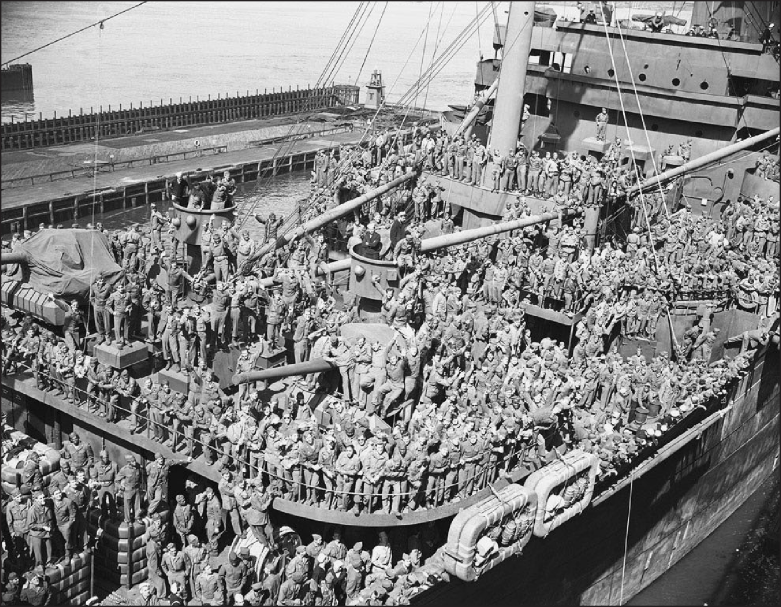 Richardson, docked in New York, with veterans of the European war cheering on June 7, 1945. 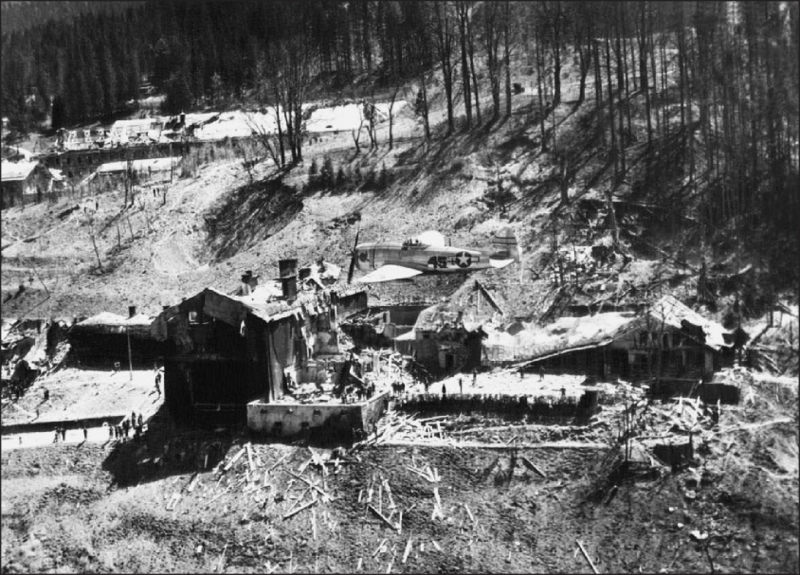 Many soldiers were veterans of the African campaign, Salerno, Anzio, Cassino and the winter warfare in Italy ‘s mountains. 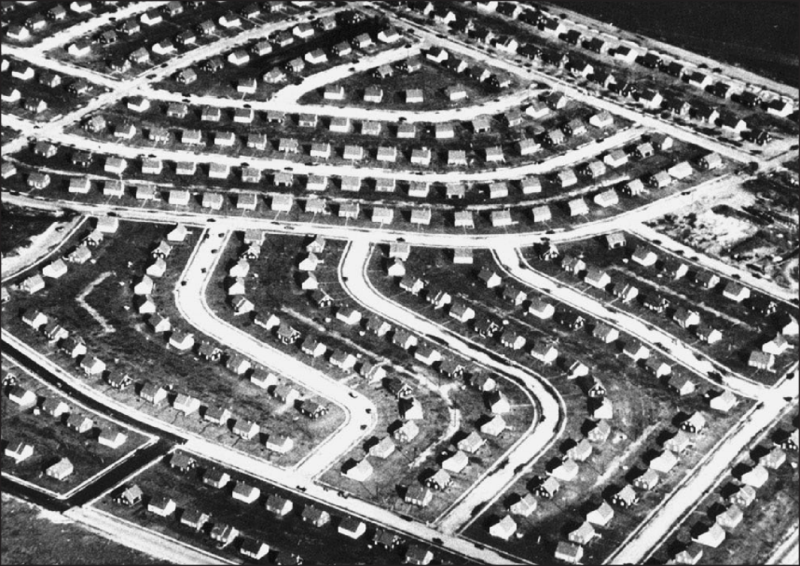 This aerial file photo shows a portion of Levittown , New York , in 1948 shortly after the mass-produced suburb was completed on Long Island farmland in New York . This prototypical suburban community was the first of many mass- produced housing developments that went up for soldiers coming home from World War II. 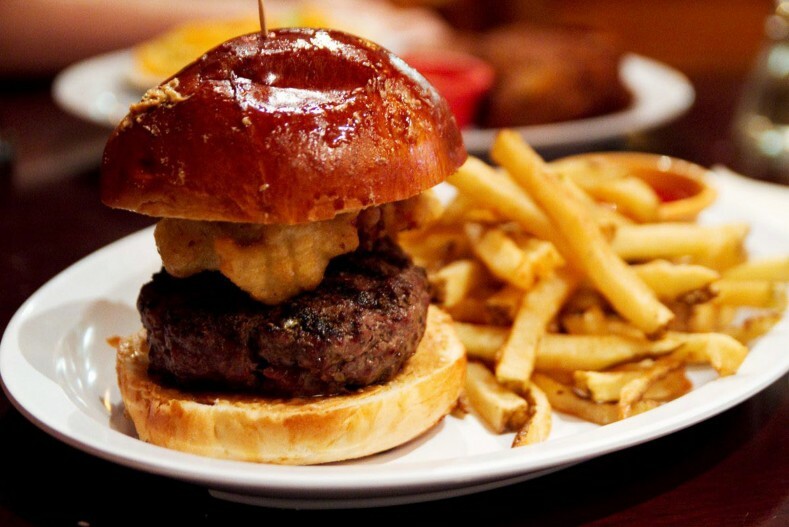 It also became a symbol of postwar suburbia in the U.S. This television set, retailing for $100, is reportedly the first moderately priced receiver manufactured in quantity. Rose Clare Leonard watches the screen, which reproduces a 5x7 image, as she tunes in at the first public post-war showing at a New York department store, on August 24, 1945. Although television was invented prior to World War II, the war prevented mass production. 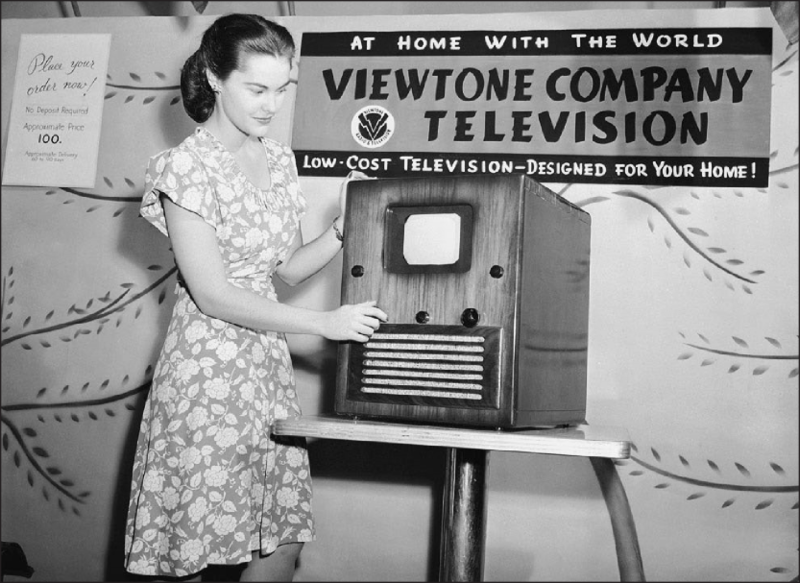 Soon after the war, sales and production picked up, and by 1948, regular commercial network programming had begun. 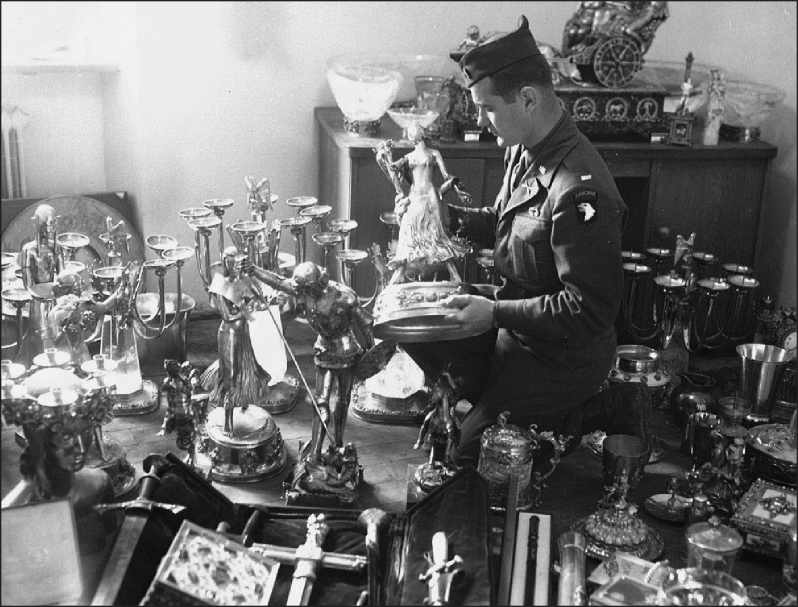 A U.S. soldier examines a solid gold statue, part of Hermann Goering’s private loot, found by the 7th U.S. Army in a mountainside cave near Schonau am Konigssee, Germany, on May 25, 1945 The secret cave, the second found to date, also contained stolen priceless paintings from all over Europe. 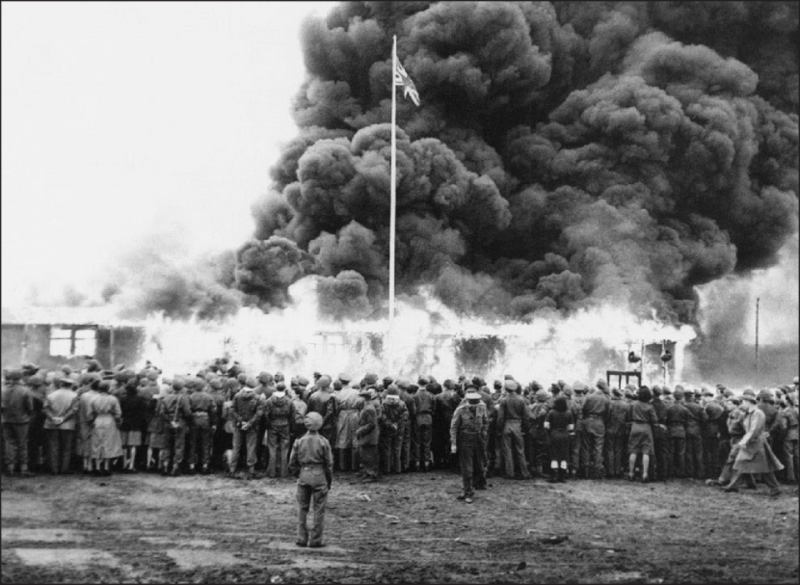 On May 21, Colonel Bird, Commandant of Belsen Camp, gave the order for the last hut at Belsen Concentration Camp to be burned. A rifle salute was fired in honor of the dead, the British flag was run up at the same moment as a flame-thrower set fire to the last hut. A German flag and portrait of Hitler went up in flames inside the hut in June of 1945. 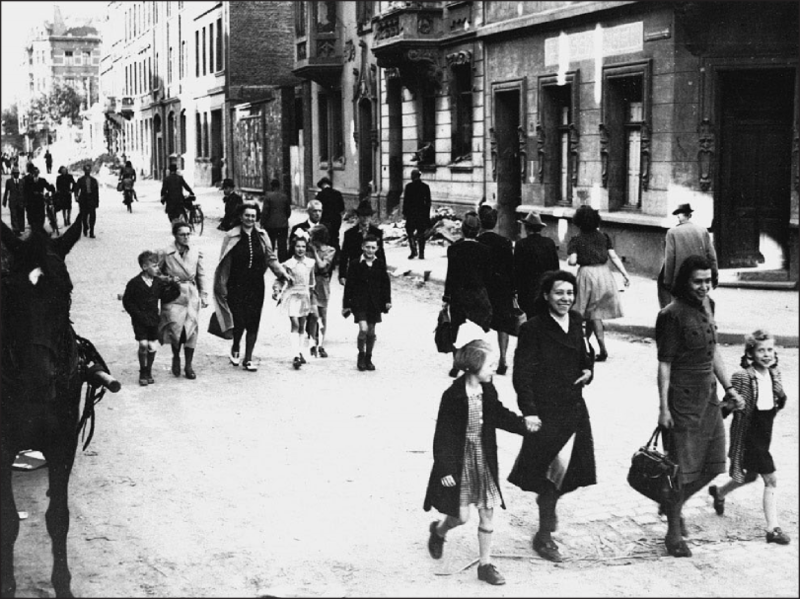 German mothers walk their children to school through the streets of Aachen, Germany, on June 6, 1945, for registration at the first public school to be opened by the U.S. military government after the war. 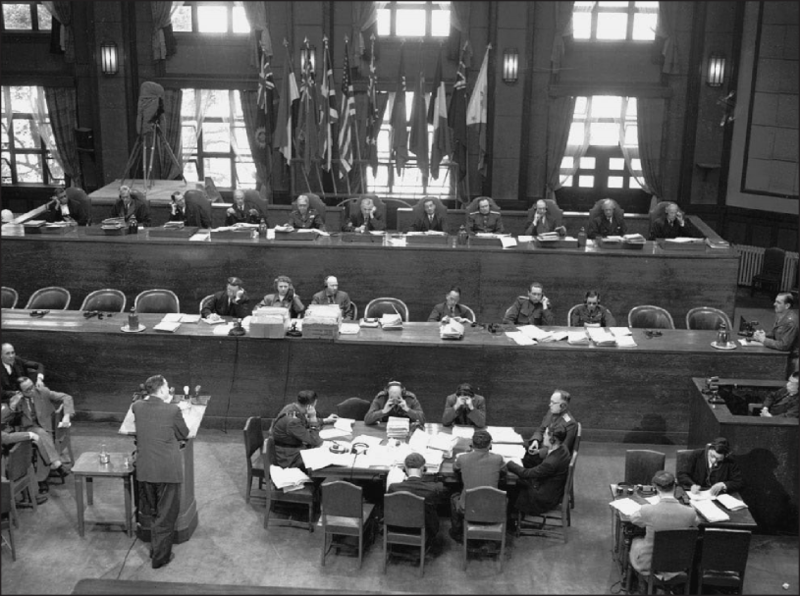 A general view of the International Military Tribunal for the Far East meeting in Tokyo in April, 1947. On May 3, 1946, the Allies began the trial of 28 Japanese civilian and military leaders for war crimes. Seven were hanged and others were sentenced to prison terms. 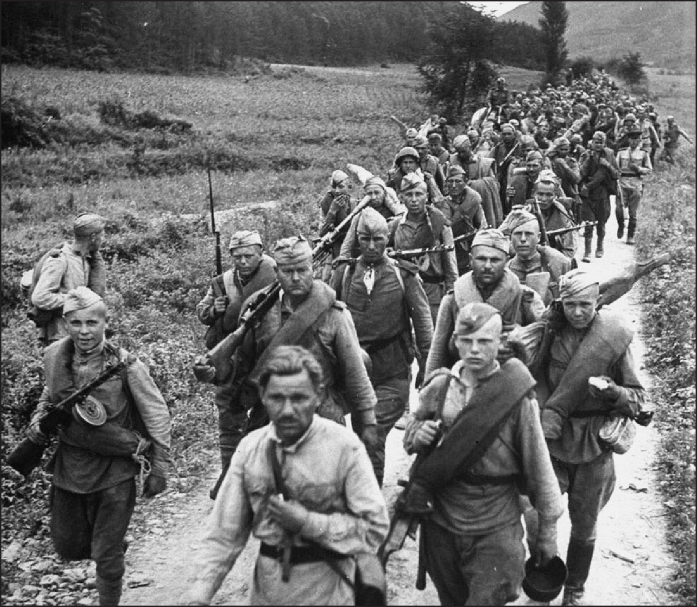 Soviet soldiers on the march in northern Korea in October of 1945. Japan had ruled the Korean peninsula for 35 years, until the end of World War II. At that time, Allied leaders decided to temporarily occupy the country until elections could be held and a government established. Soviet forces occupied the north, while U.S. . forces occupied the south. The planned elections did not take place, as the Soviet Union established a communist state in North Korea, and the U.S. set up a pro-western state in South Korea - each state claiming to be sovereign over the entire peninsula This standoff led to the Korean War in 1950, which ended in 1953 with the signing of an armistice -- but, to this day, the two countries are still technically at war with each other. 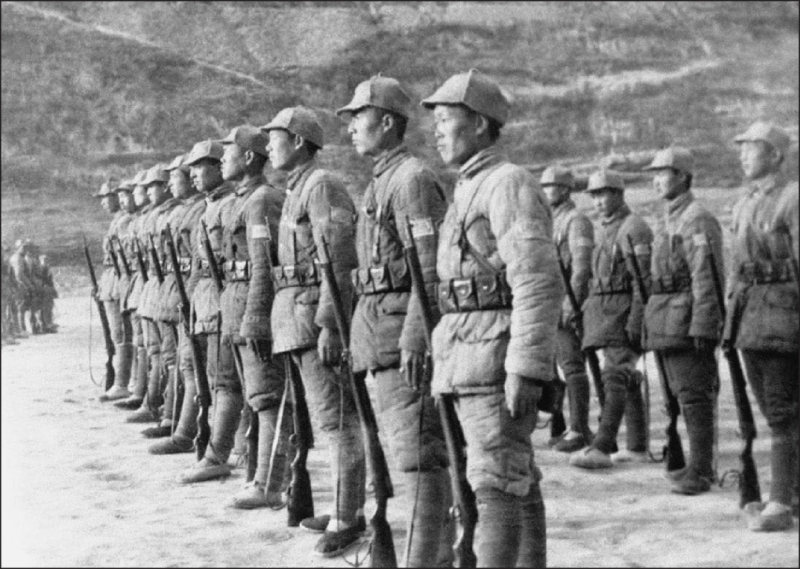 Soldiers of the Chinese communist Eighth Route Army on the drill field at Yanan, capital of a huge area in North China which is governed by the Chinese Communist Party, seen on March 26, 1946. These soldiers are members of the “Night Tiger” battalion. The Chinese Communist Party (CPC) had waged war against the ruling Kuomintang (KMT or Chinese Nationalist Party) since 1927, vying for control of China . Japanese invasions during World War II forced the two sides to put most of their struggles aside to fight a common foreign foe -- though they did still fight each other from time to time. After World War II ended, and the Soviet Union pulled out of Manchuria, full scale civil war erupted in China in June of 1946. The KMT eventually was defeated, with millions retreating to Taiwan , as CPC leader Mao Zedong established the People’s Republic of China in 1949. 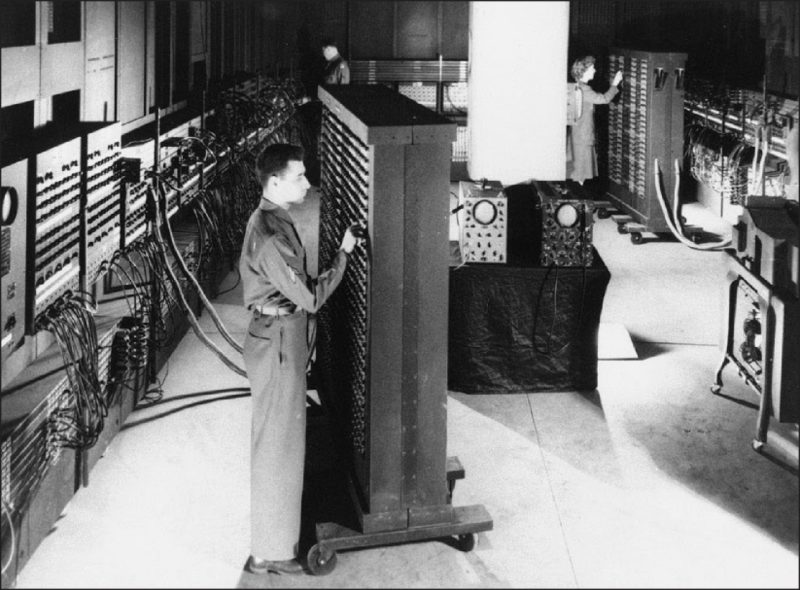 This 1946 photograph shows ENIAC (Electronic Numerical Integrator And Computer), the first general purpose electronic computer - a 30-ton machine housed at the University of Pennsylvania . Developed in secret starting in 1943, ENIAC was designed to calculate artillery firing tables for the United States Army’s Ballistic Research Laboratory. The completed machine was announced to the public on February 14, 1946. The inventors of ENIAC promoted the spread of the new technologies through a series of influential lectures on the construction of electronic digital computers at the University of Pennsylvania in 1946, known as the Moore School Lectures.